It will come as no shock to regular readers that big tech is completely out of control, as is social media giants like Twitter and Facebook, as we have been documenting the increasing intensity and frequency of their outright censorship of Independent and conservative websites, videos, and social media posts. While it is not surprising, it is important to document their censorship practices as they find new ways to silence anyone that doesn't promote or conform to their preferred narrative and official spin, because one cannot fight against attacks if they do not see them and where they are coming from. One recent example and proof of Google's censorship practices is highlighted over at Free Thought Project is Google's manipulation of search results, shown in screen shots of keyword searches and the difference in results by Google's search engine in comparison to what is seen using the same keywords using other search engines. 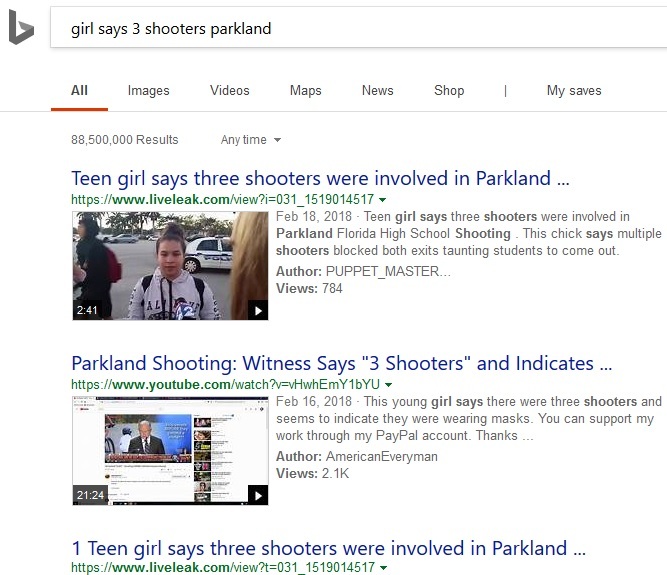 The most striking of these results came when we searched for the words “girl says 3 shooters parkland,” expecting the news footage of an eyewitness from the school saying that there were multiple shooters. 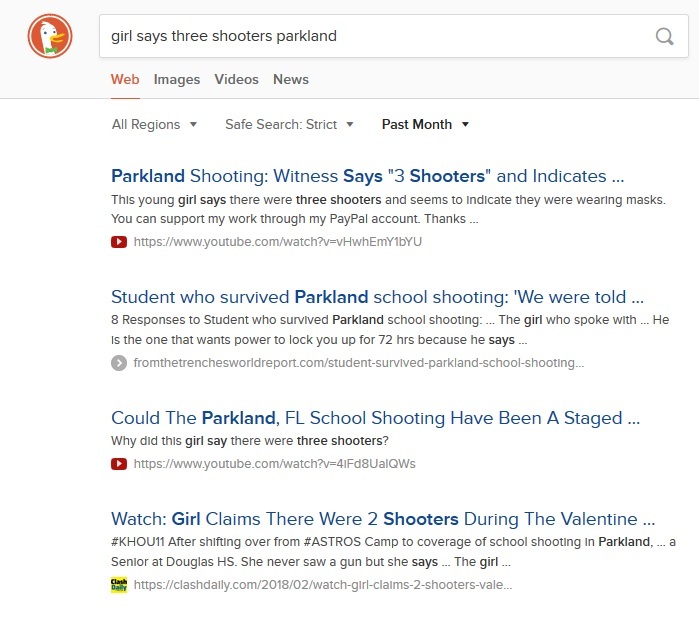 On Google this video did not come up, nor did any articles about the statement that the student made to the news, despite the fact that our search was extremely specific. 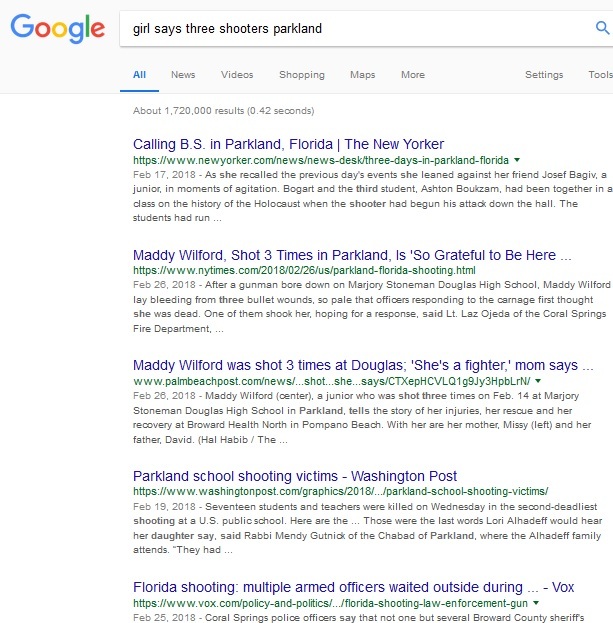 Don’t be fooled by the top article “Calling B.S in Parkland, Florida,” it is an op-ed promoting gun control. Whether one believes the information from the girl in the interview or not, is of no consequence. The fact is she said it, and Google is attempting to prevent anyone from finding something that should be publicly available and easy to find, especially using specific keywords. They are quite literally controlling what people that utilize their services are allowed to see. As ANP has highlighted previously, Google's video platform YouTube has done the exact same thing by removing any videos they do not want users to find, the most recent example was when David Hogg, hailed as the "gun control student activist," was caught practicing his lines and being coached by a CNN reporter. Dozens of copies of that video, if not hundreds, were ruthlessly scrubbed from YouTube's site, with other video platforms being the only places that video can be found and shown to the general public. Now we learn that Google's YouTube will be adding "information cues," alongside videos they determine are "conspiracy." Those will contain links to what Google deems a "fact based" website to counter the information contained within the video in questions. After demonetizing thousands of channels (many of which were “truther” and “conspiracy”-related), YouTube is now taking further steps to fight undesirable videos. YouTube CEO Susan Wojcicki announced this week that the video platform will soon begin displaying links to “fact-based” sites alongside conspiracy videos. Called “information cues”, these snippets of information will link to “reputable” articles in order to combat “hoaxes” and “fake news” stories (gotta use lots of quotation marks to highlight mass media’s biased vocabulary). Here’s how it will work: If you search and click on a conspiracy theory video about, say, chemtrails, YouTube will now link to a Wikipedia page that debunks the hoax alongside the video. A video calling into question whether humans have ever landed on the moon might be accompanied by the official Wikipedia page about the Apollo Moon landing in 1969. Wojcicki says the feature will only include conspiracy theories right now that have “significant debate” on the platform. “Our goal is to start with a list of internet conspiracies listed on the internet where there is a lot of active discussion on YouTube,” Wojcicki said at SXSW. We have to address the lack of intelligence in the decision of Google to use Wikipedia as a primary source of debunking or verifying anything. They are handy sometimes for quotes or sourcing to find original sources of information, usually more so when it is an uncontroversial topic, but on their own page they admit "While some articles are of the highest quality of scholarship, others are admittedly complete rubbish." They state on that same page "since Wikipedia can be edited by almost anyone anytime, articles may be prone to errors, including vandalism." They also advise readers "please do not use Wikipedia to make critical decisions." Please note how Google is attempting now to not only determine what is a "conspiracy," but how they are treating conspiracy theories as hoaxes or fake news. That is a very dangerous game to play, because a hoax is something put out that deliberately offers outright fake information to mislead people, where a "conspiracy," is questioning the official narrative. The CIA actually started pushing the "conspiracy theory" label as an attempt to discredit anyone that does question the official narrative. 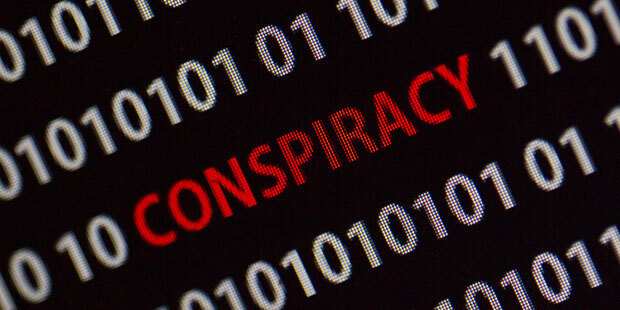 The fact is many "conspiracy theories" have later been proven to be true. One memorable example was how the MSM labeled Tea Party and Patriot groups "conspiracy theorists," when they accused the Obama administration and the IRS of targeting them due to their political ideology. Years after they were falsely labeled as conspiracy nuts, IRS official Lois Lerner publicly apologized for targeting Tea Party and patriot groups unfairly. 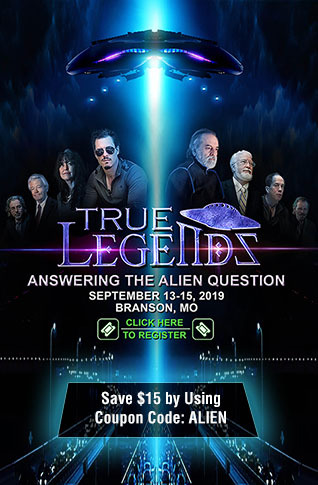 Other "conspiracies" that were discovered years later to be true include, but are not limited to: MKUltra and their CIA mind control program; Bohemian Grove, where the rich and powerful go to misbehave; the CIA funding the Dalai Lama to undermine the Chinese Government; President Lincoln's assassination had multiple co-conspirators; The CIA's fake vaccination program; Operation Mockingbird - The CIA's control over the mainstream media; Operation Paperclip: The Secret Intelligence Program to Bring Nazi Scientists to America. Those are just a few examples of the many "conspiracies" that were later proven true. They also offer one of the biggest reasons why Google/YouTube, social media giants and big tech's censorship of any news that doesn't fit the official narrative is doing a massive disservice to all internet users, because any current "conspiracy" that later proves to have been true, means that it is Google/YouTube, Twitter, Facebook and other big tech companies that will, in fact, have been pushing "fake news," by automatically declaring them false, rather than treating them as simply questioning the official, approved narrative. As always we would like to provide options, a way Internet users can fight back against this type of censorship. While we are encouraged that the idea of an "Internet Bill of Rights," is gaining traction to prevent big tech and others from discriminating and censoring Independent News and views and questions, things like that could take years to fully implement and enforce, and we need options now. Another form of censorship by Google has been Adsense program where publishers like ANP has seen the same amount of ads, the regular off-presidential election year drop of traffic, maybe 15 percent, yet the revenue has dropped by nearly 80 percent in comparison to what was brought in before the 2016 election. This has been noted by the majority of conservative or Independent News sites that supported Donald Trump in 2016. Independent Media Publishers: We can now comfortably vouch for a new ad service, Commodity Ad Network, that is geared toward Independent Media websites, as their first payment not only came in on schedule but was the exact amount their dashboard indicated throughout the first month, which doubled with one single ad, the pittance brought in by Google Adsense with three ads. They offer one banner ad per page. Independent Media sites can join here to start their way toward independence from Google. Future phases will include a social media platform, a search engine geared for Independent Media sites, and a video platform to replace YouTube, all without censorship. Another service run by people that believe in free speech and do not censor Independent News websites is Revcontent. Native ads, they pay on time, and require no contracts, and publishers are paid the next billing cycle. Advertisers: With Google manipulating search results, downranking conservative and Independent Media sites in their results, any drop in organic traffic means that advertisers are not receiving the amount of traffic they could be getting, since Google is blocking them from whole segments of the Internet. Google is also limiting what ads are being seen on those sites, which also damages advertisers that want their ads shown everywhere as part of their advertising goals. Being a new startup, Commodity Ad Network can offer those advertisers being harmed by Google's censorship practices, a whole new audience that Google is preventing them from reaching. Advertisers can join Commodity Ad Netwrok here. Search Engine Alternatives: For internet users that want to get the results they are searching for, rather than the result Google wants them to get, here are links to DuckDuckGo, Bing, Yahoo, Ask, StartPage by IxQuick. We highly recommend testing them all, then finding a favorite and setting it as their default search engine. Video Alternatives to YouTube: While it is still hard to find exactly what is needed in an embeddable format at the smaller start-ups, there are a number of things in the works. Social media website Gab just started their own Gab TV, where content creators can upload videos, with pro-members being able to livestream, without censorship. As of now there are no options to embed on external websites. D.Tube is another option, though they do need to work on their search functionality and streamline the joining process, they do offer videos that can be embedded. Vimeo is a service that does offer embed codes for websites that use clips. Natural News' Mike Adams has also announced a project called Real.Video, which will work differently than most video platforms and users can request an invite here. BitChute has seen a recent uptick of YouTube content creators who see the writing on the wall as Google's YouTube continues to purge accounts as part of their censorship agenda. BitChute does not offer embed codes at this time either. Social Media: After the massive Twitter lockout of conservatives, and the continued censorship practices by Twitter, with shadow bans, limiting the ability to share content that Twitter doesn't approve of, Gab.ai has seen tremendous growth in 2018. While the mainstream media continues to claim Gab is for the "alt-right," we have noted political ideologies from across the spectrum and they don't censor the left or the right. So far, they seem to truly be one of the few truly "free speech" social media sites. The relentless attack on Independent Media sites, specifically those that supported Donald Trump for president in the 2016 presidential election cycle, continued not only unabated, but has consistently increased in intensity. Many Independent Media sites have started moving toward ad services geared to fairness in an attempt to generate enough revenue to first blunt the impact, then reverse the trend in order to be in a position to start removing ads from services that do censor and downrank Independent voices to punish them for their political leanings. Alternative social media platforms are seeing major increases just by offering true free speech. 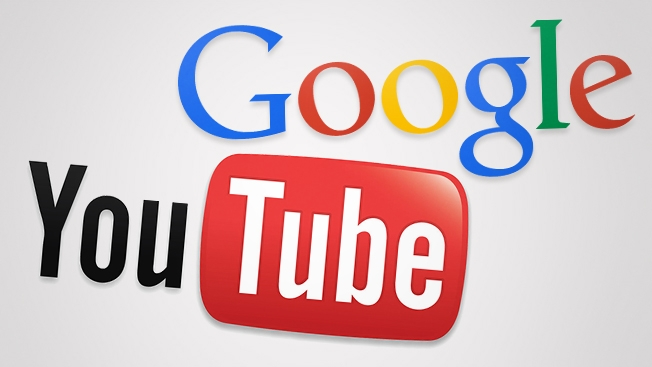 Video platforms are being created to offset Google/YouTube's censorship. Bottom line, things are looking up and moving at a rapid pace to prevent big tech from silencing our online voices. Thank You PipeLiners: Well ladies and gentlemen, it is time for a heartfelt thank you to our readers, those that comment and those that lurk, those that shared our work, and those that have humbled us with your generous donations to help us through what has been a very difficult couple of months. We now see the light at the end of the tunnel. Collectively, you all did it, you got us through March. Stefan and I just wanted to say thank you all. PipeLiners Rock! Below is the new standard donation message that will be seen below all articles.